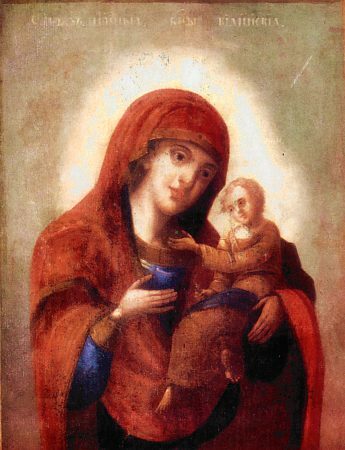 The Vilensk Icon of the Mother of God was written by the holy Evangelist Luke. For a long time it was in the family of the Greek emperors at Constantinople. In 1472 Sophia Paleologa, spouse of the Moscow GreatPrince Ivan III (1462-1505), transferred the icon to Moscow. In 1495 the GreatPrince blessed his daughter Elena with this icon before giving her in marriage to the Lithuanian king Alexander. In honour of the transfer of the icon to Vilna a feast was established 15 February. Later on they placed the holy icon in the John the ForeRunner church, in which princess Elena was buried. And afterwards they transferred the icon to the Vilensk Holy-Trinity monastery.